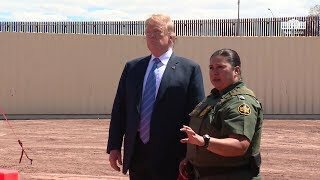 President Trump Visits the New Border Wall in Calexico, California. The first rule in the dictator's playbook is to fuel public anger against the "other" people said to be dangerous outsiders. From the start of his campaign for president, Donald Trump has sought to make immigrants from Mexico and Latin America the nation's nemesis. The second rule in the playbook is to conjure up a so-called "crisis" of containing the outsiders. America is hardly "full," as Trump has said. In fact, our aging population needs young immigrants to take up the slack. Whatever problem this surge of migrants poses isn't nearly the magnitude of threats like climate change, nuclear proliferation, or the undermining of democratic institutions all of which, not incidentally, Trump has worsened. But because America doesn't have enough immigration judges to make such decisions, families are being detained at the border. Even the Republican senator Ted Cruz proposes adding hundreds more such judges to clear the backlog. Which brings us to the third rule in the dictator's playbook: use the trumped-up crisis to enlarge and entrench power. When he's not accusing Democrats of being socialists, Trump is rallying his followers around the supposed mob at the gates. At a campaign rally in Grand Rapids, Michigan, he claimed migrants are coached by lawyers to say "I'm very afraid for my life" although they look as strong as "the heavyweight champion of the world." This flies in the face of the recent warning by the former Homeland Security chief Kirstjen Nielsen that migrants including children -- two of whom have died in federal custody -- are arriving "sicker than ever before." "When he's not accusing Democrats of being socialists..."
Are you kidding me? The loudest voices in the Democratic party right now are openly and proudly socialist. What is there to accuse? Its a fact that they wear proudly. I don't hear too many Democrats (actually none that I can recall) stepping up and denouncing socialism.